Need baby wipes?? Amazon has a new coupon that makes for a stock up price on Seventh Generation wipes! You can even stack this coupon with the 5-15% off Subscribe and Save discount for even more savings! 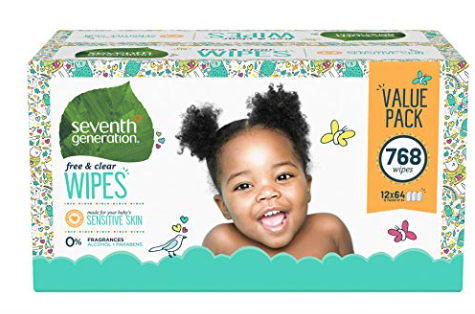 15% off Seventh Generation Free & Clear Baby Wipes, Thick & Strong with Flip Top, 64 ct., pack of 12 as low as $20.98 after coupon and 15% S&S, so just $1.75 a pack! These natural wipes are free of fragrance, chlorine bleach, parabens, alcohol and other toxins. My kids are potty trained but I still buy these wipes as they are great for having handy for cleanups in the car or house. Save 50% off all sizes of Seventh Generation diapers!